Finding protein powder that contains both soy and whey can be a challenge. Fortunately, Herbalife, DesignerWhey, and Nature's Bounty all offer products that can provide nutritional support for those looking for a protein boost. Herbalife Nutrition describes Personalized Protein Powder as a fat-free, protein-rich supplement, designed for use in shakes and as a replacement for traditional meals. Personalized Protein Powder can be helpful when it comes to maintaining energy levels and muscle protein stores, notes Herbalife Nutrition. According to Syracuse Fit Club, Herbalife Personalized Protein Powder is odorless and tasteless, making it a great choice for picky eaters. Unlike other flavored protein supplements, you can add this product to a variety of foods without an unwanted aftertaste. According to Herbalife Nutrition, Personalized Protein Powder is a good choice for individuals who are interested in building muscle mass and promoting weight loss. In fact, the protein found in Herbalife Personalized Protein Powder helps prevent hunger pains, and it is fat-free, which is a plus for those who are interested in shedding unwanted pounds. Unfortunately, purchasing Herbalife Personalized Protein Powder is not without its challenges. To buy the product, shoppers must first register on the Herbalife website, and then locate an independent distributor in their area. Individuals who are not willing to do so may instead need to purchase Herbalife through big box online retailers, such as Amazon.com, where the quality of the product in question may be suspect. It is difficult to determine the retail cost because doing so requires signing up for the Herbalife website. Herbalife Personalized Protein Powder can be purchased through online retailers, although the price for two containers is in excess of $80, making it a pretty pricey option. Herbalife Personalized Protein Powder contains five combined grams of whey and soy protein per serving -- the equivalent of a tablespoon. In addition, each serving of Personalized Protein Powder offers 20 calories, no fat, cholesterol, or carbohydrates, and 45 milligrams of sodium, which is about two percent of the recommended daily allowance for this nutrient. DesignerWhey touts it's Sustained Energy Protein Powder as a quality product for individuals who are looking for help when it comes to maintaining energy stores throughout the day. In addition to whey and soy protein, Sustained Energy Protein Powder also contains casein protein, making it an excellent choice for those who lead an active lifestyle. DesignerWhey Sustained Energy Protein Powder is currently sold in the vanilla bean and chocolate velvet flavors. According to There Are Two Sides, DesignerWhey Sustained Energy Protein Powder has good flavor, though it would be even better if it was creamier. The fiber found in DesignerWhey Sustained Energy Protein Powder is a major benefit for individuals who are interested not just in overall health improvements, but also lasting weight loss. In fact, with five grams of dietary fiber, DesignerWhey can contribute to feelings of satiety. Though the drawbacks of DesignerWhey Sustained Energy Protein Powder are few, they are important to note. In fact, this product does contain saturated fat and cholesterol, both of which can contribute to an increased risk of heart disease and other chronic health conditions. 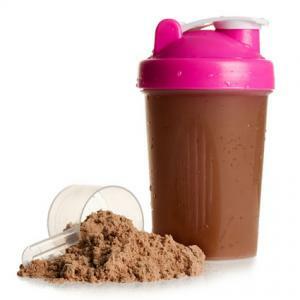 Individuals who are on a strict low-fat diet may want to avoid DesignerWhey in place of a fat-free protein powder blend. For the average consumer, however, the very small amounts of total and saturated fat found in DesignerWhey Sustained Energy Protein Powder fit well within the Dietary Guidelines for Americans. Depending on the amount they need, shoppers can purchase DesignerWhey Sustained Energy Protein Powder for under $20 for a 12 to 20-ounce supply. 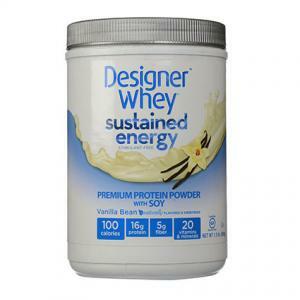 According to DesignerWhey, DesignerWhey Sustained Energy Protein Powder contains 100 calories per serving. Individuals who use this product can also expect to consume three grams of dietary fat -- one of which is saturated -- 60 milligrams of cholesterol, eight grams of carbohydrates, and 120 milligrams of sodium. According to Nature's Bounty, the Complete Protein and Vitamin Shake Mix is designed not just for those who are interested in meeting their daily protein needs, but also in boosting energy levels, immune function, and digestive system health. Nature's Bounty Complete Protein and Vitamin Shake Mix provides a proprietary blend of whey protein concentrate and soy protein isolate, reports My Protein Powder Reviews. 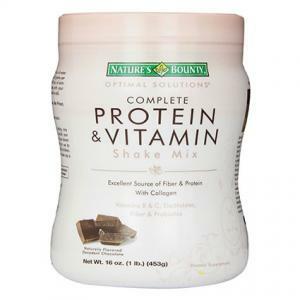 Nature's Bounty Complete Protein and Vitamin Shake Mix is available in two flavors -- vanilla and decadent chocolate. According to My Protein Powder Reviews, the product provides a good chocolate flavor that is free from clumping. My Protein Powder Reviews notes that Nature's Bounty Complete Protein and Vitamin Shake Mix can be easily combined with a variety of foods with little difficulty. The addition of flaxseed makes Nature's Bounty Complete Protein and Vitamin Shake Mix fairly unique among protein powder mixes. In Nutrition Therapy and Pathophysiology, Marcia Nelms, Kathryn Sucher, and Sara Long note that flaxseed can help lower rates of overweight, obesity, diabetes, heart disease, and other chronic health conditions (page 389). My Protein Powder Reviews reports that this product is on the pricey side. Individuals who are looking for a protein powder that can be used on a daily basis, then, make find Nature's Bounty to expensive to incorporate into their daily routine. Though Nature's Bounty cannot be purchased through the manufacturer's website, it is abundantly available through online big-box retailers for between $10 and $18 for a 16-ounce container. Each serving of Nature's Bounty Complete Protein and Vitamin Shake Mix provides 15 grams of protein, three grams of fat, and six grams of carbohydrates. In addition, the product offers a host of vitamins and minerals, including vitamins C, D, folic acid and flaxseed. Finding a protein powder that suits your needs and lifestyle may not necessarily be an easy process. With a little hard work and investigation, however, you will find a product that will soon become a pantry staple!